This recipe uses a fluffy buttermilk pancake as the base to create the best chocolate chip pancakes with three kinds of chocolate chips and lemon zest. These are the best chocolate chip pancakes in the world. I am not kidding (and I know a thing or two about flavoured pancakes). You can stop your search right now and save this recipe. 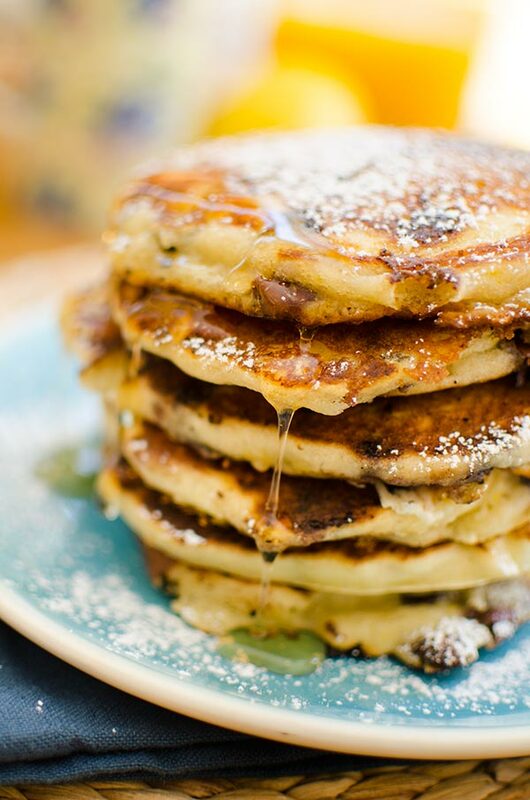 There is just something about the combination of a fluffy buttermilk pancake with the addition of three types of chocolate chips and a little bit of lemon zest. 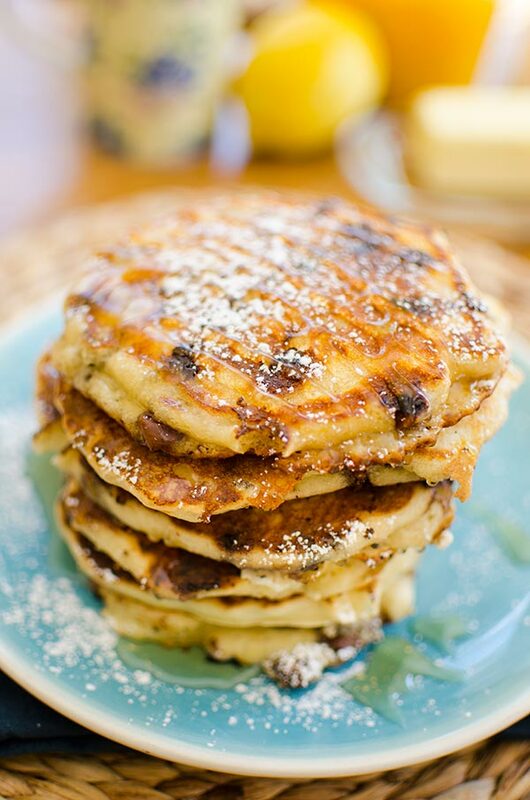 I know, lemon zest in chocolate chip pancakes! What on earth? But trust me, this flavour combination just works and the lemon zest is the element that just ties this entire pancake together. Where did I get this idea? A couple of months ago, I was reading a wonderful book called Eight Hundred Grapes by Laura Dave and it was this book that inspired the recipe. The book is about a family who runs a vineyard, but food plays a pretty large role in the scenes in the novel. There’s the harvest feast, and the scene set in the kitchen where the three grown children huddle around a steaming lasagna, bonding and eating it right out of the pan, and then of course there is the scene that inspired these pancakes. Two of the characters end up at a brunch spot in Sonoma County, where they apparently have the best chocolate chip pancakes because they are made with dark chocolate, milk chocolate and white chocolate. Ding, ding, ding! That got me thinking. Then, later on in the scene one of the characters talks about the chocolate chip pancakes from her favourite brunch spot which has lemon zest in the batter. I’m not kidding you, right when I read that description of the pancakes, I knew I had to try and recreate these Eight Hundred Grapes pancakes and if they turned out as deliciously as I imagined, I would eventually share them with you. Well, it’s been a few months (I finished the book in January), and I am finally ready to share this recipe for what I think are the best chocolate chip pancakes. I started off by making these pancakes with just a typical batter, but quickly realized that the pancake I was dreaming about was a fluffy, buttermilk pancake. I took the base of a classic buttermilk pancake, added some lemon zest and three kinds of chocolate chips (I have semisweet, milk chocolate and white chocolate chips in my version) and voila, magic! Have you read Eight Hundred Grapes? I really enjoyed it and am always looking for more book suggestions (currently reading Everything I Never Told You by Celeste Ng). In a medium bowl, whisk flour with sugar, baking powder, baking soda, lemon zest and salt. In another medium bowl, whisk buttermilk with canola oil, eggs and vanilla. Scrape buttermilk mixture into flour mixture and whisk to combine (the batter will still be lumpy). Sitr in chocolate chips. Heat a large non-stick pan over medium heat. Spray with oil. Pour 1/3 cup batter into pan. If the pan is big enough, you can cook multiple pancakes at once. Cook until bubbles form on top of each pancake and edges begin to brown about 2 to 4 min. Flip and cook another 2 to 3 min. Repeat with remaining batter. Serve with maple syrup. Let me know if you try these chocolate chip pancakes in the comments below! Nothing like some delicious chocolate chip pancakes! Thank you for the recipe. Pinned! I love this recipe. I sent it to my niece in Montreal and the kids adore the pancakes! Thank you, KC! I hope they enjoyed them! Accidentally, the chocolate chips made their way to the bottom of the bowl that I was using - and honestly - these pancakes are SO MUCH BETTER WITHOUT CHOCOLATE CHIPS (in my opinion)!! I think the chocolate masks the real flavor of the pancakes. These are THE BEST pancakes I have ever made, and had. Thank you so much for sharing your recipe!